Get your own Dedicated Server with Complete Root Access!!! In our India Data Center!!! Do I get root access to my Dedicated server? Yes, you get full root access, which means you have full administrative control of your dedicated server hosting. You can choose to install any software you wish to. What kind of support do I get with my Dedicated server? We offer two levels of support for all dedicated hosting plans: core-managed and cPanel relevant support. All dedicated servers come with core-managed support, and if you have chosen to purchase cPanel through us, we offer additional support options relevant to cPanel. When will my Dedicated server be ready once I've placed the order? We use a proprietary provisioning system which ensures that your dedicated server hosting is ready instantly. Yes, you read that right - your server is available for use immediately. No 24 hour wait, no setup fees. What kind of hardware do you use for each Dedicated server? Our dedicated server hosting uses the SuperMicro blade chassis, which has a small footprint with reduced power consumption and cooling requirements. These efficiencies allow us to pass cost savings down to you so your costs are kept to a minimum. Our servers are powered by Intel Xeon HyperThreaded processors, DDR3 RAM and 7200RPM SATA drives. We allow speeds of up to 1Gbps on each server's network port. Yes. Each dedicated server comes with a 1TB hard drive pair, which is in a RAID 1 configuration. This means that your data is mirrored, so there is a copy on each drive. If one drive fails, you will still have a copy on the other drive. Our hard drives are 7200 RPM SATA drives. How do I expand the storage capacity on my Dedicated Server? 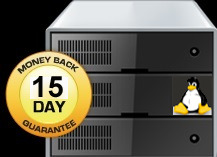 Why you sell only Dedicated Servers & not offer also VPS Plans? Our Dedicated Servers costing less than a good VPServer Plan and most times all VPS stop up to 200GB Disk Space with less RAM or other features, so it's better to start with your own server that to share your data with others!! !.